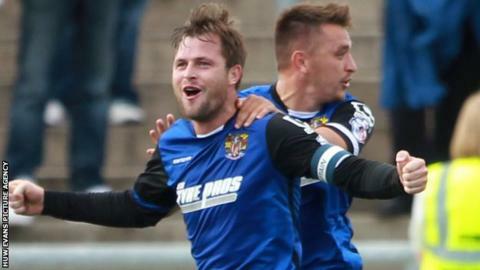 Stevenage defender Mark Hughes scored in stoppage time as both sides picked up their first point of the season. Boro took a deserved lead shortly before the break when Dipo Akinyemi finished off a fine counter attack. An improved Newport hit back through an Aaron Collins header before Scott Boden slotted home with 11 minutes remaining. Hughes headed home to grab a draw, but Medy Elito wasted a great chance for Newport seconds from time after Regan Poole's shot was saved. "I didn't think we were comfortable against their set plays, in the first half in particular. "You always felt there was a sting in the tail unless we could get that third goal. We had plenty of opportunities to do just that. "It was a bit of a sucker punch in many aspects." "We've had enough experience in the team to control the game, but we decided to do other things. Credit to Newport, they changed the way they played a little bit. Disappointing stuff from our point of view of conceding two goals. "Can't fault our character. Tough start in the game, Tuesday was just as hard. Commitment, endeavour, work rate from my squad of players there. I'm delighted to end up with a point." Match ends, Newport County 2, Stevenage 2. Second Half ends, Newport County 2, Stevenage 2. Corner, Stevenage. Conceded by Kieran Parselle. Attempt missed. Medy Elito (Newport County) right footed shot from the right side of the six yard box is close, but misses to the right. Substitution, Newport County. Tom Owen-Evans replaces Scott Boden. Goal! Newport County 2, Stevenage 2. Mark Hughes (Stevenage) header from very close range to the bottom left corner. Foul by Tom Hitchcock (Stevenage). Substitution, Stevenage. Dale Gorman replaces Charlie Lee. Substitution, Stevenage. Tom Conlon replaces Steven Schumacher. Corner, Stevenage. Conceded by Aaron Hayden. Goal! Newport County 2, Stevenage 1. Scott Boden (Newport County) right footed shot from the centre of the box to the bottom right corner. Corner, Newport County. Conceded by Mark Hughes. Substitution, Newport County. Aaron Hayden replaces Scott Barrow because of an injury. Attempt blocked. Medy Elito (Newport County) left footed shot from the left side of the box is blocked. Danny Holmes (Newport County) wins a free kick on the right wing. Substitution, Stevenage. Tom Hitchcock replaces Dipo Akinyemi. Corner, Newport County. Conceded by Jerome Okimo. Attempt saved. Scott Boden (Newport County) header from the centre of the box is saved in the bottom right corner. Attempt missed. Medy Elito (Newport County) left footed shot from outside the box is just a bit too high. Aaron Collins (Newport County) wins a free kick in the attacking half. Delay in match Aaron Collins (Newport County) because of an injury. Attempt blocked. Medy Elito (Newport County) right footed shot from outside the box is blocked. Attempt missed. Dipo Akinyemi (Stevenage) right footed shot from outside the box misses to the left. Foul by Aaron Collins (Newport County). Fraser Franks (Stevenage) wins a free kick in the defensive half. Goal! Newport County 1, Stevenage 1. Aaron Collins (Newport County) header from very close range to the top right corner. Assisted by Scott Barrow with a cross. Attempt missed. Kieran Parselle (Newport County) header from the centre of the box misses to the left following a corner.